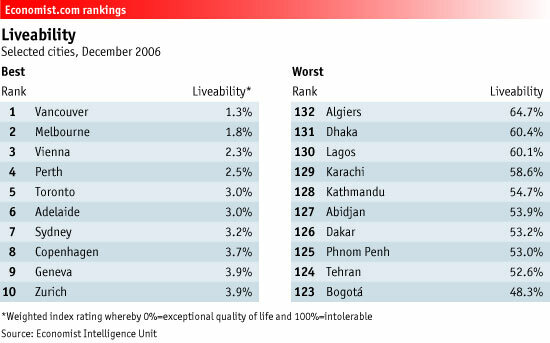 In this Economist article several world cities are rated for their "liveability". The article is actually a pointer to the full report and notes that the largest cities in the world were not considered. Surprisingly, the little gems - cities such as Victoria in BC or Quebec City in Montreal do not appear to have been considered either, despite being the not-so-secret gems of those provinces. Or maybe did the authors want to keep them uncrowded?